I was having a silly day while looking at my Halloween stickers and papers. The word printed word 'SCREAM' made me think about the old diddy we sang as kids......"I Scream, You Scream, We All Scream for Ice Cream!" My crazy brain thought how funny it would be to have a scary ice cream cone. The Martha Stewart carved pumpkin punch seem like just the right one to use for the "scoops of ice cream" and so the card took shape with the help of the cone from the Sizzix die. By cutting the cone from a white core brown cardstock and texturizing it with a Cuttlebug embossing folder and then sanding the cone, I was able to achieve a realistic-looking effect. (You could just hand-cut a cone and draw lines on it.) 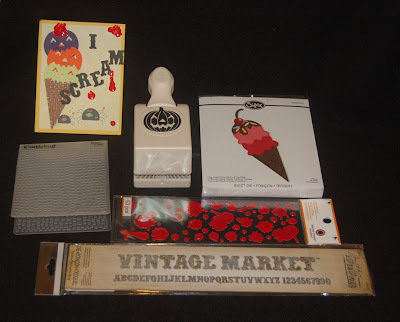 The Tim Holtz Vintge Market letter die set was used for the words. I love this Sizzlet die because it cuts the whole alphabet plus numbers! The Martha Stewart blood splatter stickers added the finishing yucky touch. Why did I make a silly card? Well, it's fun and kids just love the weird/scary stuff (even big adult kids). This card could be used to contain a Yogurtland gift card for a Halloween treat. Did you know that Yogurtland has two Halloween flavors? Check out the Pumpkin Pie and Blood Orange frozen yogurt....yum! There's still time to enter my blog candy Halloween giveaway (scroll down to see previous post). You have until noon on Oct. 1, 2010 so hurry and leave a comment! Okay I know you've all been waiting for a Ben Franlin Craft Club contest. Here's it is! And all you have to do is leave a comment for this post.....anything will do but if you want to tell me about your favorite holiday craft project I'd be pleased to hear about it. So easy and you might win all the blog candy (approx. value $30) shown (and some hidden in the bag) in the photo including a $25 Ben Franklin Crafts gift card. Your comment must be received by noon Oct. 1st. I will randomly draw a name and announce the winner by Oct. 3rd. You will have to check back to this blog site to see if you are the winner and if you are, then you will need to send your mailing address to me. (I'll tell you how to do this later.) So post a comment and win! There are so many Halloween ideas floating around in my head that I'm going batty trying to remember and make them all. 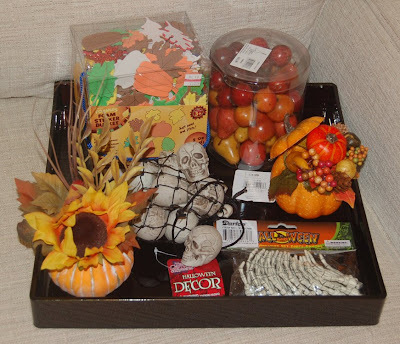 Someone recently remarked that Halloween has taken on a bigger importance than Thanksgiving. I think that is due to the fact that the younger generation is not into cooking a big feast and would rather order in or eat out on Thanksgiving. Also families are sometimes continents apart so having a family dinner is a problem of logistics and cost. Therefore, Halloween just naturally became a favorite celebration because it is fun to be spooky and collecting free treats is always a kid-pleaser. Anyway, if you like decorating your house for Halloween (my kids really loved ghastly stuff), here is a simple, low-cost decoration that even your children will have fun making. Using the EK success bat paper punch, punch out two bats for each finished bat you want. Run the two bats through the Xyron machine. Place two flat-back red crystals on the sticky side of each bat punch out (for the eyes). Sprinkle black glitter (Darice Halloween glitter set) or black Fun Flock on the bat. Glue (Fabri-Tac) the glittered/flocked bats back to back, upside-down with a ribbon end sandwich between them. 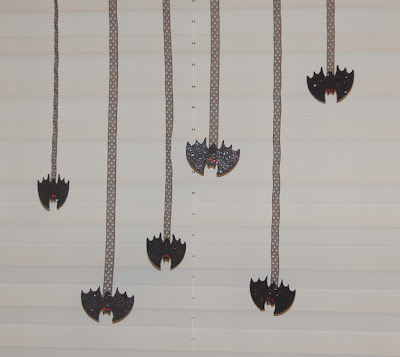 Hang the bats where they can flutter in the breeze or use them for embellishments /bookmarks. Keep your sanity and have your kids craft batty decorations for Halloween. 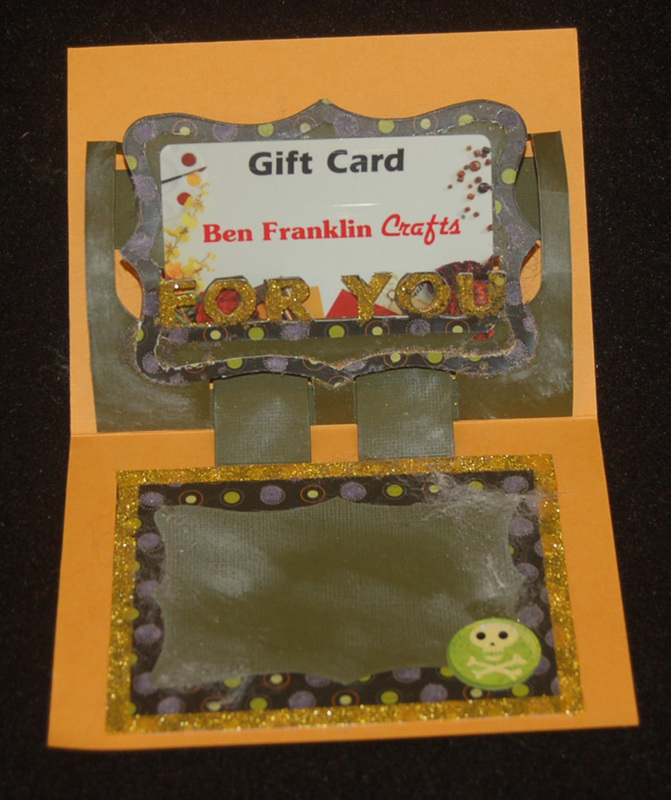 Ben Franklin Crafts is the place to shop for your Halloween decorations! There are so many autumnal and spooky items to choose. The top photo shows what I purchased recently. I really like the resin? casted skulls and hand skeletons. They give a scary decorating impact for very little cost. There are tombstones and strings of spiders too. 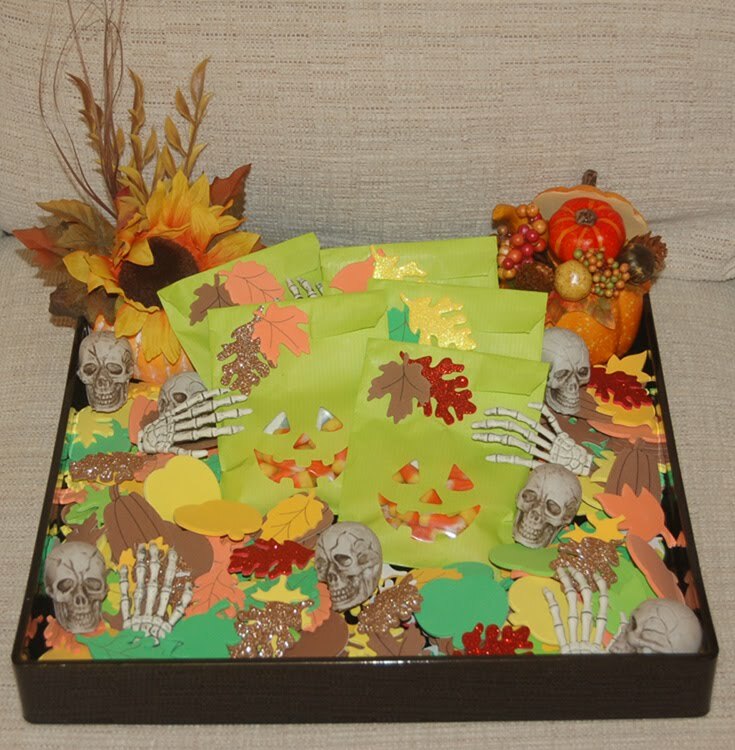 BFC has many different packs of adhesive backed autumn foam pieces but by far the best buy is the large acetate box filled with leaves (some glittered) and pumpkins. The filled mini pumpkins are a super easy way to decorate your house for autumn. Wouldn't they be adorable along a window sill or down a cloth runner on your dining table? The black lacquer tray is a Sierra Pacific product and for $12.99 it is a bargain because it can be used for serving food too......appetizers anyone? The second photo shows how I arranged the items. The treat bags were made by punching flat paper bags with the EK Success jack-o-lantern face punch. Then I filled small ziploc-type jewelry bags with candy corn and slipped them into the bag. The tops of the bags were then sealed with some of the adhesive backed foam leaves. I think it is wise to make simple treat bags for the trick-or-treaters because they are really only interested in the candy. I haven't decided what to do with the miniature apples and pears but I'm thinking they might look nice in a pedestal glass bowl with some sparkly beads.....maybe that will be my Thanksgiving centerpiece. Thanks for reading this blog post. I hope that I've given you some decorating ideas to make your holiday season more colorful and fun. Look for the kid-spirit in yourself; it will keep you young. I'm not sure how many of you are interested in collecting antiques, but I am passionate about collecting objects with history. I enjoy learning about the purpose for odd items and what dictated their design. Although I am not a history major, thinking about the history of mankind is fascinating. The period that most fascinates me is the Victorian era (1890-1910) because it was a time of over-the-top decoration and excess. There's a ton of gaudy stuff out there just waiting to be collected. 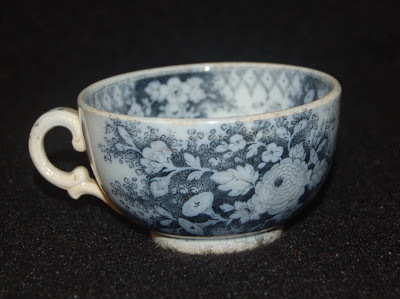 This tea cup is missing its saucer which is why I picked it up for a song (trust me, a song from me is cheap, under $5) even though it is probably a real antique piece (over 100 years old). This very tiny transferware (not hand painted and slightly flowblue glaze) cup may date from as far back as the 1850's (flowers look a bit Asian so possibly it is from the Aesthetic period) but most likely it is from the Victorian era. The reason it is so small is because tea was a prized commodity and highly taxed (remember the Boston Tea Party) so servings of tea were also petite. I plan to turn this mini cup into a pincushion where the inside mini pillow can be taped down and removed if desired. This will preserve the integrity of the ceramic piece. Can you guess what these pieces were used for? Probably you guessed that they are vases but actually I believe they are fireplace mantle decorative pieces used for holding long stick matches. 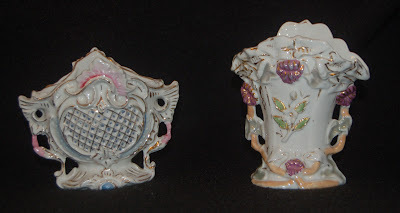 The reason I think that this was their purpose is because the backs of these pieces are glazed but not colored which suggests that only the fronts were to be displayed. I think these pieces are slightly younger than the teacup and date them to be from the 1920-30's because of their gold details. The style suggests they are European (possibly Austria or Germany) but there are no maker's marks. I can't quite remember but I don't think I spent more than $10-$12 for either of them. Anyway, I love these pieces and want to look at them often so I've placed the containers in my bathroom and use them to hold make-up brushes. 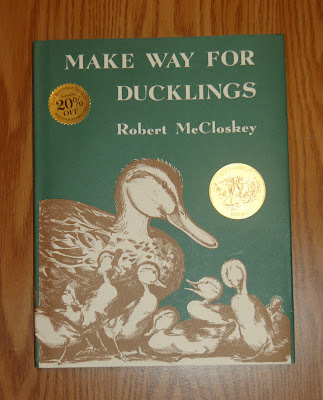 I hope this blog post has been of interest to you and that perhaps I've inspired you to keep your eyes open for bits of history to preserve and enjoy. If you look at collecting as a way of recycling and learning about a past culture, I'm sure that your crafting/collecting gene will get excited. Thank you for visting this site today. Never stop learning and thinking creatively! 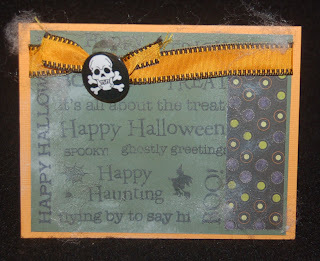 package) but are individual Halloween sayings from a Hero Arts clear set. Although it is a bit tedious to set up the words in a pattern, it is great to have so many different sized Halloween words. 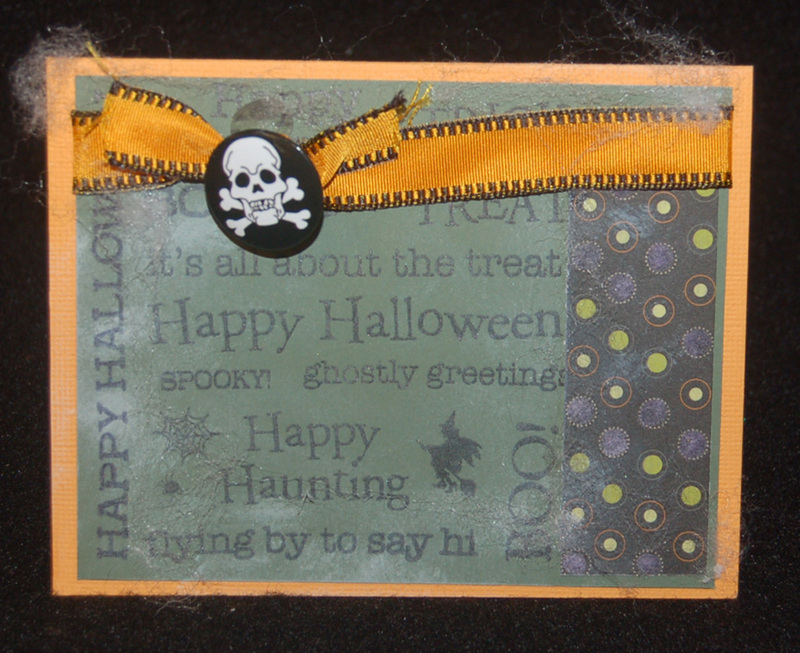 I am very pleased with the Sizzix die and can imagine many future projects. One of these Halloween cards will be given away (with a Ben Franklin Crafts gift card and other goodies) in an upcoming blog contest. 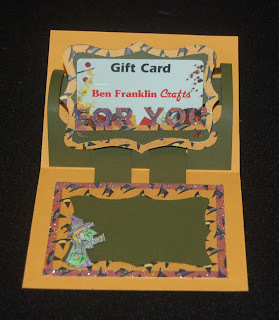 Keep checking back here and watch for an announcement in an e-mail blast from Ben Franklin Crafts. I can't believe it's time to take down my box of Halloween craft stuff.....didn't I just put it away? 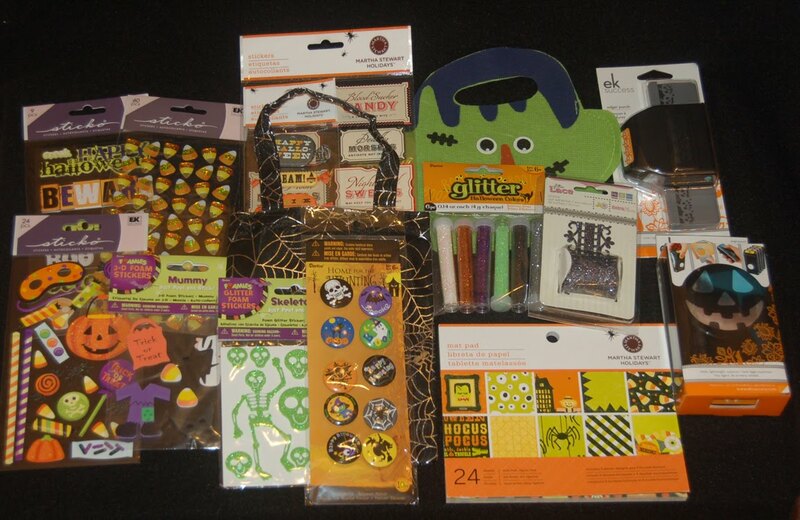 Oh well, Halloween is another excuse to buy some really cute/scary supplies. This year the punches seem bigger and the stickers more detailed. I think I'm going to break down and get the web punches even though I can't think of using them at any other time of the year.....I'll buy the punches and not candy for me this year......that's a healthy choice LOL! 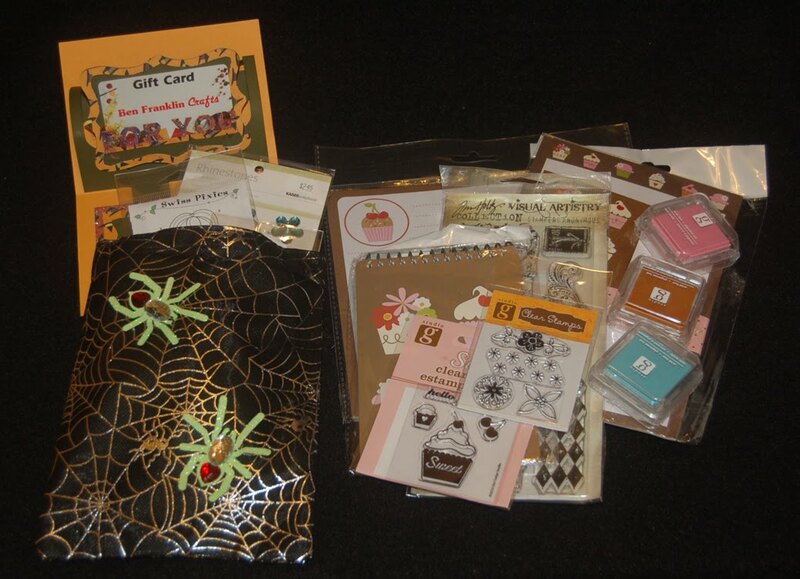 Pictured here are some of the spooky Halloween goodies I got from Ben Franklin Crafts. 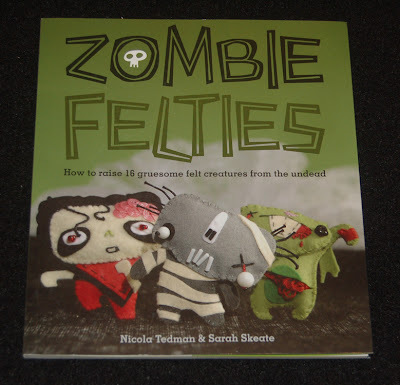 The other photo is of the cutest book about making felt dolls. The dolls are small and seem very easy to create. I plan to make some and tuck them into my Halloween cards. Keep crafting because you know it makes you smile and that's good for you. As usual I needed a special card...pronto! It was for someone receiving an Eagle Scout award. Congrats Aaron! The only items I had in my craftroom that even vaguely suited the project were ones with the fleur de lis design which sort of looks like the boy scout emblem. So with two rubber stamps and a Sizzix die, I began to stamp and cut. 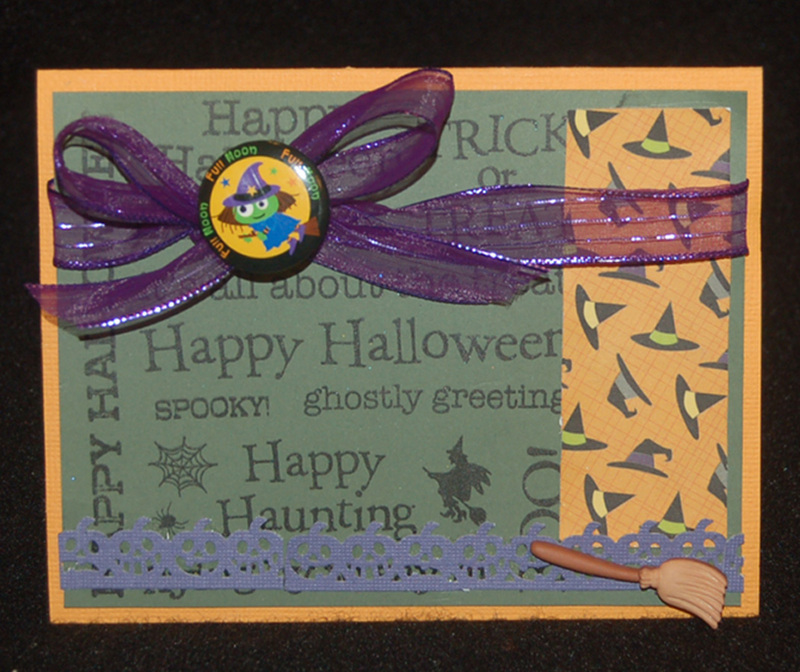 Using mustard and olive green colors also helped to unify the card theme. The final touch was the circular tag made using the Making Memories metal rim and tag making system....remember, you probably bought one and it's tucked away somewhere.....take it out and make some new embellishments. Anyway, I just wanted to show you that sometimes when you are short on time and don't think you have the right supplies, you can still whip up an appropriate card. Never ever buy a card.....that's a crafter's no-no! I discovered these G Studio stamps at Ben Franklin. I thought that they were perfect for decorating summer and travel scrapbook pages. 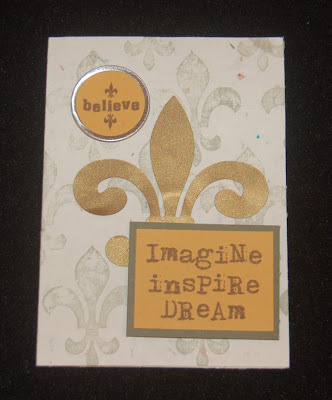 They would probably work well with Tim Holtz products too because some of them have a distressed look. 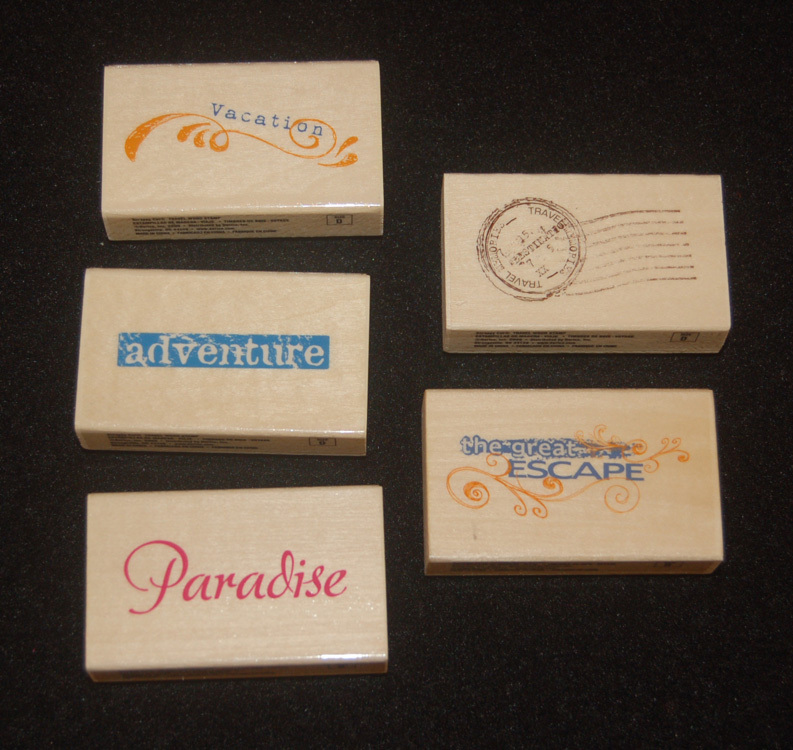 Best of all, the stamps were only $1.25 each....gotta love that! 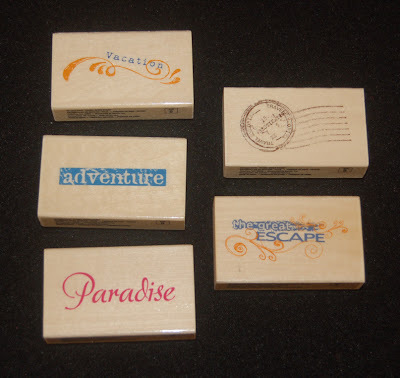 When I have the time, I'll design something using these attractive wood handled stamps. 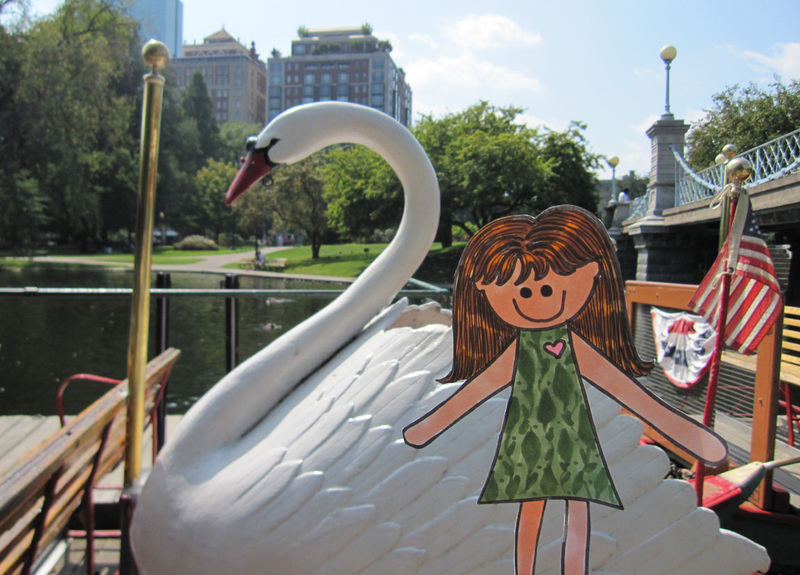 Sorry, this is a short post ...busy, busy, busy!